I have also analyzed some research and data on the effect of gaming on labor skills. I have always suspected a positive relationship between gaming skills and skills that could be applicable in other professional industries so I wanted to look more into it. I discovered that the research does suggest that video gaming can improve labor skills, however, the evidence on the effects on cognitive and motivational skills seems more compelling than the evidence of effects on emotional and social skills. Google Scholar, PsycINFO, and Pubmed were the three databases that were used. I also focused on recent studies instead of older studies. According to Granic, Lobel, and Engels (2014), labor skills include four domains: cognition (e.g. attention), motivation (e.g. resilience in the face of failure), emotional (e.g., mood management), and social (e.g. prosocial behavior). Cognitive skills are particularly important in jobs requiring rapid decisions and a broad overview (such as air traffic controllers), whereas motivation in the face of challenge is an important competence in jobs involving problem-solving assignments (such as software development jobs). Emotional skills are important in care and nursing jobs and social skills are essential in all types of jobs involving human interaction. In study The malleability of spatial skills: a meta-analysis of training studies, Uttal et al. (2013) examined to what extent training programs improved spatial skills and whether gaming could produce equivalent spatial skills improvements. The authors meta-analyzed 217 research studies on spatial skills training and concluded that spatial skills can be trained. Furthermore, they concluded that commercial video shooting games produced the same improvement in spatial skills as 1) school programs targeted at improving spatial skills and 2) laboratory training with specific spatial skill exercises. Thus, shooting games can improve spatial skills to the same extent as targeted school subjects and laboratory training. Chiappe et al. (2013) examined whether action videogames can improve multi-tasking in high workload environments. 53 American university students (18-36 years) with no action videogame experience were pre-tested using the Multi-Attribute Task Battery (MATB), which measures multitasking skills. Following this pre-testing, half of the students engaged in playing action video games (Ghost Recon 2 and Unreal Tournament 3) for a minimum of 5 hours a week for 10 weeks. All students were then retested with the MATB. The results showed that the group of students who had played action video games were better at managing multiple tasks, and the authors concluded that action videogames can increase people’s ability to take on additional tasks by increasing attentional capacity. Venture et al. (2013) examined the correlation between gaming and persistence during difficult tasks among 102 American university students. The authors measured persistence by recording the time spent on unsolved anagrams and riddles in an online test. The participants also completed a questionnaire on how many hours a week they spent playing video games. Results showed a positive correlation between time spent on playing video games and persistence, which means that frequent video game players spent more time on unsolved problems relative to infrequent video game players. The authors concluded that gaming can improve persistence. Adachi and Willoughby (2013) examined whether strategic video game play (i.e., role playing and strategy games) predicted self-reported problem-solving skills among a sample of 1,492 Canadian adolescents. Participants were asked if they played strategic video games and if they played fast-paced video games (i.e., fighting, action, racing). Participants also completed a questionnaire with five items regarding problem-solving skills (i.e., “I think hard about what steps to take’’ and “I think about the choices before I do anything” and “I tell myself ‘Stop and think before you do anything’”). The authors found that more strategic video-game-play predicted higher self-reported problem-solving skills over time than less strategic video game play such as fast-paced games. In addition, the results showed support for an indirect association between strategic video game play and academic grades. Gaetan et al. (2016) examined the relationship between video gaming and emotional functioning such as emotion regulation, emotion intensity, emotion expression, and alexithymia among 159 French adolescents. The participants were asked if they played video games regularly and from their answers, the sample was divided into “regular gamers” and “non-regular gamers”. Furthermore, the participants completed a series of questionnaires on different dimensions of emotional functioning. Results showed that regular gamers were more active in regulating their emotions and felt their emotions more intensively. Results also showed that regular gamers engaged in less emotion expression and that they were less able to put emotions into words. The authors concluded that that video gaming is not unambiguously enhancing emotional function and that more research is needed. Durkin and Barber (2002)  examined the relationship between game play and several measures of adjustment and risk taking in a sample of 1,304 16-year-old American high school students. The participants completed a questionnaire asking if and how often they played video games. They also completed a series of questionnaires on wellbeing, adjustment and risk taking. Results showed no negative effects on gaming and showed positive (favorable) effects on family closeness, sports involvement and other social activities, engagement in school, mental health, drug use and peer relations. The authors concluded that gaming can affect the social development of adolescents positively. Additionally, Gentile et al. (2009)  summarized three studies examining the relationship between prosocial games and prosocial behavior among Singaporean, Japanese and American children and adolescents. All three studies showed a relationship between prosocial games and prosocial behavior. Specifically, the studies showed that prosocial video games enhanced short-term helpful behavior and that children playing prosocial games at the beginning of the school year behave more social during the end of the school year. The authors conclude that the three studies provide robust evidence of a positive effect of prosocial games on prosocial behavior – short term and long term. In addition, it is proposed that violent video games can also enhance prosocial behavior if they center on corporation rather than individual competition. Regarding cognition, two studies were summarized of which one showed positive effects of shooting games on spatial skills and one showed positive effects of action videogames on multi-tasking skills. As for motivation, one study showed that video gaming can improve persistence during difficult tasks and another study showed that strategic video game play predicted problem-solving skills. Regarding emotional function, one study was summarized which found that video gaming is not unambiguously enhancing emotional function. Finally, two studies on the effect on social skills were summarized. One study found that gaming can affect the social development of adolescents positively and another study found that prosocial games can enhance prosocial behavior. In sum, this brief report on research studies supports the notion that video gaming can improve labor skills in other industries outside of gaming. However, the evidence on the effects on cognitive and motivational skills seems more compelling than the evidence on effects on emotional and social skills. Gaming and esport project manager, keynote speaker and adviser. 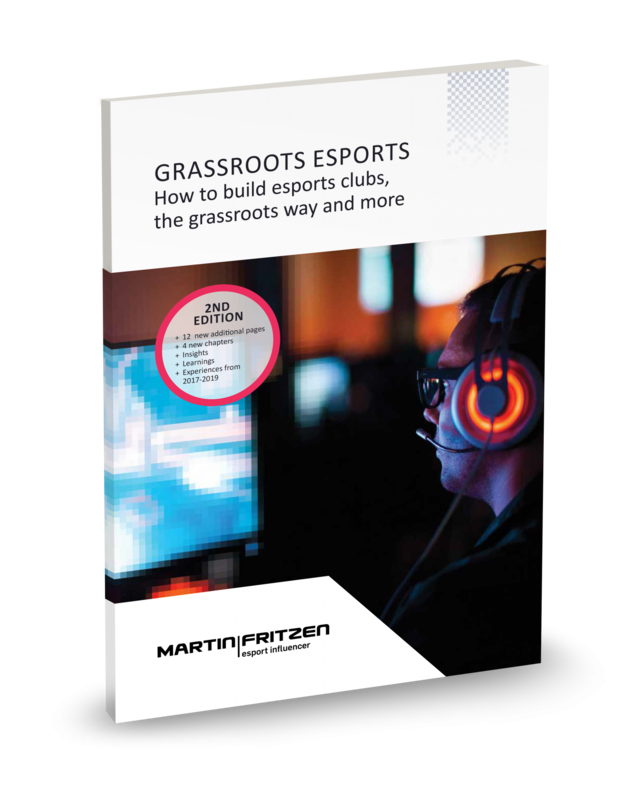 I develop and implement esport activities with grassroots sport organisations. Bringing new members, new sponsors, new activities and media coverage for grassroots sports clubs. GET A FREE EBOOK TODAY! FREE: GET A FREE EBBOK TODAY!" Step 6: Who is doing what and when? What about money and huge prize pools in grassroots esports? Should we be afraid of computer games and grassroots esports?